Fantastic views and the bedroom was incredible! We had a Jacuzzi bathtub which was even better. Cleaned every day and the view from the balcony made it even better! The food was lovely and you had a different choice every night. Wonderful entertainment of an evening. I went with my boyfriend and it was our first holiday together and my first time abroad (certainly something I shall never forget!) Would recommend staying here but if not defiantly in Paphos. Holiday was incredible! Excellent food, great entertainment and - NO KIDS! We have a problem living in Cyprus (Limassol) that not many places offer cabaret type entertainment. Many hotels offer the obligatory singer/keyboard player but that isn't really what we want to see. So when our friends mentioned the Thomson Gold hotels have this kind of stuff on tap we decided to give it a go and just spent a very good couple of nights at the Atlantica Golden Beach (near Kissonerga) in Paphos. We booked 2 x standard twin rooms on Half Board basis for 2 nights via the Thomson UK website which equated to €270.62 for 4 people. We upgraded to the AI Drinks Package on arrival directly with the hotel at €14.90 per person per night. We got tea & coffee making facilities delivered to our room as part of the AI package and as we are Atlantica Loyalty Club members, we also received the fluffy dressing gowns, fruit and wine basket plus an optional Late Checkout. If you book direct with the Atlantica Group website you also get 20% discount but for us it was cheaper to book with Thomson. The beds are very comfy and have memory foam mattresses which we found to be a little on the warm side. Flat screen TV with English channels, toiletries and a hairdryer are all part of the parcel. The food was excellent with an amazing array of choice and very attentive staff in the restaurant. You have to wait to be seated in the dining room of an evening. And my favourite breakfast was catered to: Pancakes! The evening entertainment on the first evening was fabulous with a resident duo (Jinx) and a guy who was flown in for the evening: Craig Harper who was on Britain's Got Talent in 2008 and performed the full version of this song on Wednesday 12 December at the Atlantica Golden Beach Hotel. Sadly for us, it was a Cyprus Night for the entertainment so not very good planning on our part! But the singing duo was still there and Marcus who was the Thomson Gold resident entertainer kept everyone happy. He's moving on to Malaga very soon though. We won the Bingo though, so no complaints! Only one thing we found annoying and that's the weird button system on the bedroom doors for Room Service or not. The usual position for a switch is up for off and down for on. But be warned, that's not how some of the Room Service request buttons work! We never touched our buttons but it seems one was in the "Do Not Disturb" position and our room didn't get cleaned on Thursday. We only found out when we got back late in the afternoon to find a note under the door informing us the room wasn't cleaned because our button was in the on position. A chat with the Reception got it fixed and the room was tidied plus fresh towels added by the time we returned again in the evening. All in all, we had a great time and will definitely consider going back to this hotel again in the future or to one of the others in different parts of our island. 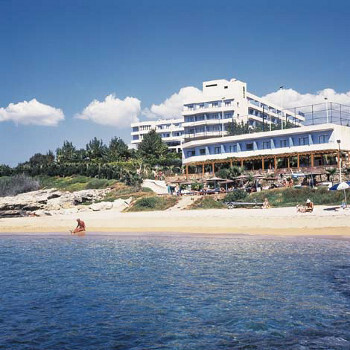 The hotel has just had a refurb but still quite rough about the edges .It is located halfway between Paphos and Coral bay so you are stranded at night and need transport through the day which isnt a big problem. The food is ok and the beach taverner had just reopened .The staff are very freindly and attentive but unfortunately the entertainment is awful , UK and Hotel based .If you have been to this hotel in the last five years its the same acts with the same jokes, songs etc which is a great sheme as the hotel deserves better , but i do feel Thomson are cutting things to the bone especially in this department . We have just returned from a weeks stay at this hotel and I can honestly say it is fantastic - we enjoyed every minute. We booked half board, but on arrival we were offerred the chance to upgrade to all inclusive which can either be the drinks package at 17 Euro per person per day or 24 Euro ppd for lunch and snacks as well. This was well worth it as you can spend a great deal of money on soft drinks alone during the day as it is so hot! The hotel is spotlessly clean and the room was fine with nice views over the pool and sea. The food was out of this world. Everything you could think of for breakfast. Omlettes of your choice were cooked to order. Lunch was set in a lovely outdoor taverna overlooking the sparkling sea. The evening meal was superb every night with a great choice of Greek dishes as well. As an added bonus you can dine once per stay free of charge in the A La Carte restaurant in the hotel which made the night extra special. The hotel staff were very friendly and obliging. The Thomson entertainment team were excellent also. The evening entertainment was standard - the type you get anywhere in the Med. The downside to this hotel is that it really is in the middle of nowhere - although you may see this as a plus if you want a get away from it all relaxing time. It cost about 15 Euro in taxi into Paphos and buses are regular and cheap. The beach is a let down and can hardly be called a 'golden beach' it is just a little scrap of pebbly sand. However this did not bother us as the pool is lovely with sunbeds aroud the pool and on the grassed areas. We will definately be returning to this hotel in the near future. The staff at this hotel were excellent and could not do enough to help you. The food was excellent with a huge choice of dishes to choose from. The rooms were quite adequate but the bathroom could have done with a re-furb. The hotel is situated a few miles north of Paphos but the bus service is very good and we never waited more than 15 minutes for a bus. approached several times by people on scooters and on foot with promotional tickets to try and get you back to their headquaters and sell you dodgy timeshares and holiday clubs! The entertainment at the hotel finished about midnight and this could be heard clearly fronm the room as the show area is only tiny so the doors are left open so people can hear it sitting outside. The air con was turned off on the 1st of November as this was officially the winter season but the temperature was 27c during the day! So it was very warm trying to sleep at night! All in all a good hotel in a quiet area. On arrival hotel was lovely and clean . However when we checked into our room it smelt of smoke and looked tired . Indeed much of the hotel looked tired . Our biggest disappointment was the food . We expected this to be good , but found it to be very average . Overall felt hotel fell short of standard expected from a Thompson Gold hotel . Lovely hotel, good food but there could be more choice although the quality was excellent. Staff and service was first class. We paid for a superior room but the bathroom was very small and poorly lit. Although we were AI in a superior room we had to pay extra for safety deposit box and use of the fridge in our room, this has not been our experience in previous hotels eg Riu etc. Overall we had a very enjoyable holiday. We went to the Atlantica for New Year and had a fantastic time.